The first thing I knew I needed to do was change the color. I didn't want anything too dark, so I bought some RIT dye in Petal Pink. 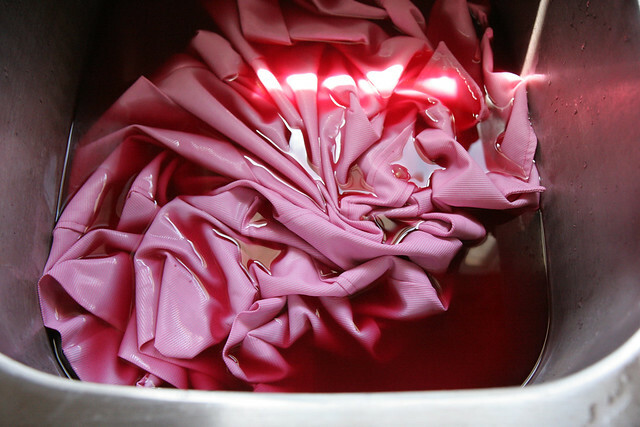 Dyeing the dress was a little tricky because it's polyester. That's the thing about polyester, you never know how it's going to take color. I was very pleased with the resulting shade of pink. Next I added a little embellishment to the pockets just for fun. This was a bit of vintage trim from my stash. Ohh I love the change! What a pretty shade it turned out! Great work! And the wee bow is adorable! this is so cute makeover! I love it! and you look stunning! so cute. perfect upcycle. and i think you could totally take it less pop shoppy by putting it with lace tights and maybe even keeping the top button open and adding a floral scarf. great dress!! 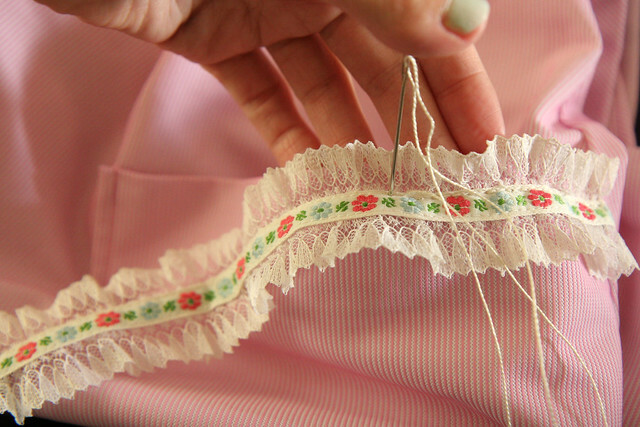 Love the result, super pretty vintage trim! It looks adorable, I like it in both versions, but the pink is way cuter! Great job on this, Katie! I love the details. You look so pretty, as usual! Can't wait to see the new look for your blog! I am so impressed! I guess it helped that the original dress was quite pretty too, but you just opened up my eyes to a whole new level of possibilities for my wardrobe. Super, cute, thanks so much for sharing! Amazing! It looks fab. I never think to dye things, it always seems like it might lead to disaster! Oh Katie so SO cute!!! Love your new dress! you look so adorable! i wish i had your figure. i love how the dress turned out. excited to see your blog changes. i am having mine re-done this summer. it's time. Oh man, I love the original and I adore the re-make! Gorgeous and the pocket details are fab! I love this dress! Very cute! 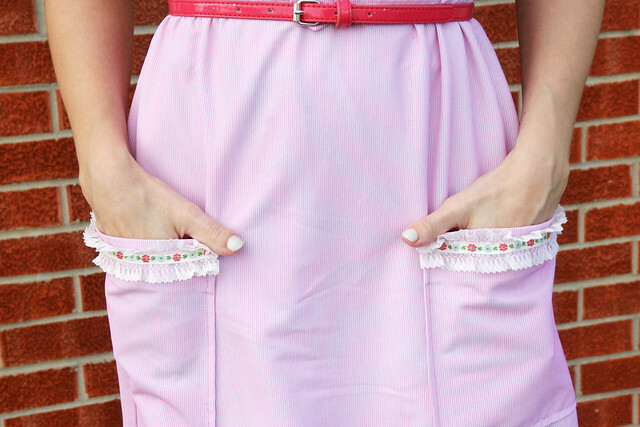 That pink is a perfect shade with your beautiful hair and I love the pocket trim. Can't wait to see the new blog changes! Oh wow! 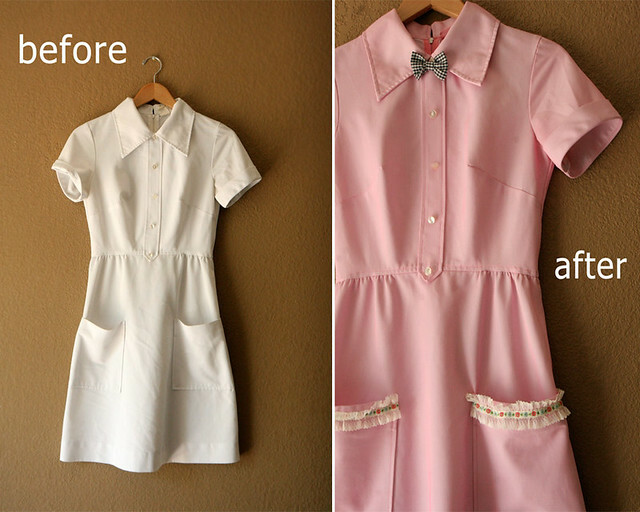 I can't believe the transformation of this dress!!! You made it a billion times better! Love the pink so much! I like what you did with it. It suits you much better now, and you look so cute in pink! That is adorable! Lovely job. WOW!!!! This dress look incredible in pink! 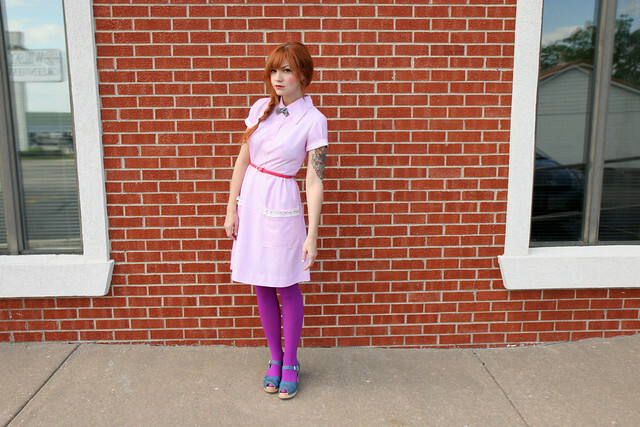 Way better than the plain white nurse-y lookin' dress. I NEED to try this stat! That came out soooo beautifully! You made it a hundred times cuter. The tiny bow is a great touch. 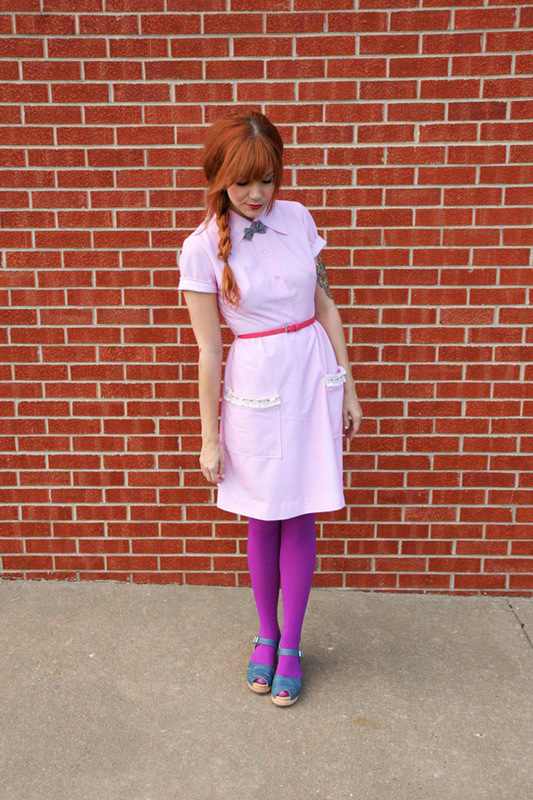 I really like the soda shop look... I even have one of those little hats they wear but have never figured out a non-silly way to wear it. what a great fit! I'm glad you worked it out. This post has given me inspiration to try changing up some of my clothes that I don't like/wear! The end result is super cute! Katie, this looks so pretty! <3 I love the little bow especially! I'm curious about the blog changes! it came out amazing! i love it pink so much more! So so cute! Looks beautiful with your arm tattoo colors,too! I love the colour nd the little bow--what a difference! Gosh, you could wear a garbage bag and still look amazing! So wearing a dress like this is just cute overload! Love the changes you've made to it. So simple but they make such a difference. Dying can always be a bit hit and miss but this shade is definitely a hit! This is just adorable! I need to start using fabric dye. It suits you perfectly now. And I love the blog changes. 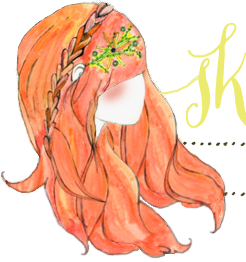 It seems to be blog makeover season right now. Wow, apart from becoming an amazing dress; that image with the dress lying in the dye is just Art!! Superb. That is so beautiful! You did a really great job! How freaking adorable and what a fantastic idea!! I'm definitely going to have to try this out on some of my dresses that aren't quite right! oh my gosh! i love this! the little bow tie is adorable! You have Megan Fox thumbs!